Light heavyweight may have just gained another dangerous member. Thiago “Marreta” Santos has contested his entire UFC career at 185 pounds … right up until accepting a late replacement fight in Sao Paulo at 205 pounds. Initially against Jimi Manuwa, he ended up facing Eryk Anders … and defeating him in impressive fashion (watch it here). Now it sounds like he’s considering an extended stay at light heavyweight, and perhaps even making it his new home. But first things first: Santos wants what he originally agreed to: a bout with British slugger Jimi Manuwa. Santos is just the latest fighter to make his mark at 205 after struggling to get noticed at 185. Anthony Smith exploded into the light heavyweight rankings after a single win over “Shogun” Rua and is now set to face #2 ranked Volkan Oezdemir at the end of October. If Santos gets his hands on Manuwa, he may find himself at the top of the light heavyweight division, which seems better than sitting outside of the top ten at middleweight. Lyoto Machida is enjoying life at Bellator MMA and has a good close working relationship with the executive team, something that he wishes he had with his former employer, the Ultimate Fighting Championship. The last thing Dan Hardy expected to hear in the wee hours of the morning on Sunday was a callout from one of UFC on FOX 22′s big winners. Hardy was watching the event live from the U.K. when co-headliner Mickey Gall submitted Sage Northcutt with a second-round rear-naked choke. Gall then surprised fight fans by asking for a dance date with “The Outlaw.” The moment was especially unexpected considering that Hardy’s last fight was over four years ago, but the Englishman took it all in good fun. “I almost spat my tea out of my mouth when I was watching it,” Hardy said in a joint interview with Gall on Monday’s edition of The MMA Hour. “It was like four o’clock in the morning when I was watching, and I just wasn’t expecting it. I appreciate the callout. I appreciate the respect that you’ve shown me. But I’ve never fought anybody with less than eight fights, not even in my first pro fight. It’s just, we’re in different phases of our careers. Gall has made a name for himself for a string of UFC callouts in 2016, starting with his bout against CM Punk and leading into his prime-time tilt against Northcutt. The strategy has paid major dividends for him over the course of the year — his high-profile placement on UFC on FOX 22 despite his relative inexperience is proof of that — but in this case, Gall took his declined invitation in stride. Hardy, 34, used to be one of the more popular figures in the UFC welterweight division, however these days he is more of a media figure than an active fighter, working as both an analyst and color commentator under the UFC umbrella. The switch from a fight life to the one he lives now was forced in 2013, when Hardy was diagnosed with the heart condition Wolff-Parkinson-White syndrome. That diagnosis forced his hand and made Hardy look elsewhere for opportunities outside the cage, though he has always remained steadfast in his desire to return to professional fighting. Hardy is actually scheduled to undergo two final days of testing in January to determine once and for all whether fighting is a viable option for him, so in that regard, Hardy understands where Gall was coming from and appreciates the 24-year-old’s willingness to take a chance. “I think he’s realistic,” Hardy said. “He said in the post-fight press conference that it was a bit of a haymaker, a bit of a wild callout, and I appreciate that. It surprised me, but I appreciate that. It was very respectful of him. I don’t think it was done in bad taste in any way. I wasn’t offended by it. But you know, there’s 100 guys on the UFC roster who would be much better opponents for him right now. Of course, Hardy is also an analyst — and a terrific one at that — so he couldn’t help but play a little fantasy matchmaker of his own. Gall said this past weekend that Hardy’s title fight against Georges St-Pierre at UFC 111 was the first UFC event he ever attended live. Hardy’s own first UFC event that he attended live was UFC 85, which featured a headlining bout of Thiago Alves vs. Matt Hughes. And so he figured that if Gall was in search of a veteran opponent with a known name, Alves may fit the bill. “That’d be a great fight for him,” Hardy said of Alves-Gall. “That’d be really fun, if he wants to fight a veteran. A guy struggling to make 155. I think we should introduce a 162 weight class. Have those two guys pioneer that. … 160 is five pounds over lightweight and 10 pounds under welterweight, and I think 162, the extra two pounds, it’s a better meeting ground. Former UFC welterweight champion Georges St. Pierre sounds like a man who is enjoying life away from the Octagon. SEATTLE — Robbie Lawler discusses his change of opponents before UFC on FOX 8, his opinion of Bobby Voelker, how close he is to a title shot, his beard, and much more. LAS VEGAS — Frankie Edgar talks about his UFC 162 fight against Charles Oliveira, receiving less media attention heading into this fight, why he decided to stick around at featherweight, getting inducted into the Jersey Short Hall of Fame, and more. If you thought that Jason Miller would stop being “Mayhem” once he retired from mixed martial arts, well, you’re in for a surprise. The former standout fought all over the world in a pro career which stretched back to 2001 and retired soon after his UFC 146 loss to C.B. Dolloway. On his last career victory, a Sept. 2010 submission win over Kasushi Sakuraba in Dream, which was followed by a bow captured in an iconic photograph: It kind of like, was in my head head a little bit, like, I have to show this man respect. Because, the young meets the old, right? So it’s like, at this point in my career and in my life, I get to be Sakuraba. In the moment, it just spontaneously combusted. I feel like, in my head I feel like I owe this man so much respect and I have to beat him up because that’s my job. I did what I said I was going to do, I submitted him. I felt bad for punching him in his face super hard. I got him one time like ‘bink’ and I felt it inside my knuckles and I was like ‘aww, that was a good one.’ And I looked at his face and he was like [imitates Sakuraba], looking around all wild. That’s when I jumped and I grabbed him and I choked him. It was sweet. That’s a move I learned from him, I feel like, just watching him. On a memorable two-round casino fight against Chael Sonnen in 2002, which Sonnen won by decision: He’s like an American Hero. He’s the white knight of the Republicans. I think it’s hilarious. Chael Sonnen is the politician to end all politicians. I feel like I’d finance his campaign if I was the Koch brothers. At an Indian Casino, he put me through the floor one time, I knocked his eyes in the back of his head. I didn’t know I was fighting him. It was only two rounds, it was whack. This was back in the day. [Sonnen won a] decision, he got me with the takedowns. He got me in a double leg really nice, I was like, ‘wheee.’ I remember thinking “man, I’m going to knock his head off, wheee,” [It was a] cruddy cage, he slammed me through the floor one time, then we had a gentleman’s agreement not to go there. On an underground fight when he was breaking in: I fought in a basement one time, it was a weird thing, it was like Bloodsport. It was crazy, looking back at it. Basically, there’s video out there too, it’s looks like the basement from Saw. There’s a wrestling mat on the ground, and a ring attached to the wall on the concrete. I got on this dude’s back and started choking him, this guy was weird, he wanted to wear some ninja shoes. This was 1999, ’98 or something. This was a small gym fight … it was completely illegal. North Carolina, too. I got on the guys back and we tore the ropes down off the concrete wall. I was like, what are we going to do. They pulled the ropes down and everyone got around in a circle. … I was paid $ 200. On the status of his left knee, which needs surgery: [The UFC] pretended they were going to give me the surgery, and they started acting like they were going to fix my leg. They went back and they dragged it out until my insurance coverage expired. So I couldn’t get the surgery. … Same one I hurt in the fight. If you’re walking around with no ACL for one year, Kobe Bryant is a p***y…. I’m walking around like the hunchback of Notre Dame over there. That’s the problem. I got so used to ignoring pain over the years from doing the job that I did, and that is a bit of genetics because my dad’s done the same thing, then, try to work out? Nope. On the one fight he never got and wish he had: The obvious answer is Nick Diaz, right? I was trying to get that fight a long time ago. And we were all going back and forth and angry at each other. I think I understand Nick Diaz very well. I think I can understand the some of the points he’s trying to make. I know what he’s saying, he’s expressing frustration with his job and with the way the’ve handled the promotion of him and the way they carted him around to things he didn’t want to do. I get it. I get what he’s trying to say, how he doesn’t feel respected despite how big his accomplishments are. He didn’t feel respected, he didn’t feel anyone was looking out for him. On being informed Diaz is now running his own promotion: That’s awesome. I guess he did have some money to invest in something. This is going to be the best show ever. I’m interested to see. On this weekend’s upcoming Antonio Rodrigo Nogueira vs. Fabricio Werdum fight: I’ve trained with both of those guys. I think, man, I think on a hunger level, you always hate to pick against your man. Nogueira, I love this man. But I believe it’s maybe a passing of the torch. When I left King’s MMA, I see who still hungry Werdum is, and I see how hungry he still is. I’m biased, because I have a black belt from Werdum. … I expect an exciting fight. I expect kicks. I expect him to go leg kicks, body kicks, because as Nog is trying to come forward with boxing techniques, then he’ll counter him with kicks, and hopefully we’ll see a little jiu-jitsu fest. Press Release – April 22, 2013 – The two new stars in the MFC’s newest division are physically the smallest men on the roster, but they have created one of the biggest buzzes of any fight in company history. And for Ryan “Baby Face” Benoit he’s enjoyed every minute of the ongoing war of words he’s engaged in against upcoming opponent Anthony Birchak. All of their heated banter is leading to a hotly anticipated battle in the MFC’s debuting bantamweight division at MFC 37: True Grit. “The Twitter battles and words back in forth have been fun to me. I’ve never had so much public hype on a fight so it’s something kind of new to me but it’s all fun and games,” said Benoit. “I’ve never truly gotten angry about any of the comments. I just laugh and try to think of something better to say. The next big step comes Friday, May 10 when Benoit (6-1) and Birchak (9-1) forget about the barbs and instead exchange strikes and submission. Their fight highlights the AXS TV Fights card emanating live from the Shaw Conference Centre in Edmonton, Alberta, beginning at 10 p.m. ET/8 p.m. MT/7 p.m. PT (check local listings for channel designation). The verbal rivalry took an interesting turn last week when Birchak and the hosts of an online radio show all stated that Benoit was no big test and that the fight would come to a quick conclusion. Benoit wasn’t the least bit concerned about the on-air shot he was taking, opting to patiently wait for the right time to shoot back. Ready … aim … fire! “Anthony is going to be on the list of my quick finishes,” stated Benoit. “His wild brawling and swinging to a takedown won’t work on real skilled fighters. Benoit (Twitter: @babyfacebenoit) may very well know what he’s talking about, having racked up four of his six wins inside the opening round plus five career victories coming by way of knockout. The Dallas, Texas, product is keeping a relatively standard method to his training camp, raising the focus in just a few specific areas. He’s not at all worried about Birchak’s plan of attack. Instead he’s focused on making sure things go his way once the opening bell rings. An impressive outing for the winner of this showdown will put them into a fight to become the MFC’s first bantamweight champion. Benoit wants to makes sure he’s first in line to the crown. “Being in the MFC is dream come true in my career,” Benoit stated. “I feel very blessed to even be able to get on the show and now the exposure I’m getting as a fighter and a person is amazing. Tickets for MFC 37: True Grit are available at www.ticketmaster.ca or by calling the MFC Ticket Hotline at (780) 504-2024. It should have been a given that Duane Ludwig would get quick results. His nickname, after all, is “Bang,” a moniker he earned even before his record-setting, six-second knockout in 2006. As a trainer, he’s made immediate strides with his new camp, the Sacramento, California-based Team Alpha Male. Hired in December 2012, Ludwig recently went through the process of training several charges for the first full camp, including a trio that prepared for fights at last weekend’s UFC on FOX 7. The result? Three first-round TKOs predicated on strikes. The success comes as no surprise, according to Ludwig, who in an interview on Monday’s edition of The MMA Hour, credited Chad Mendes, Joseph Benavidez and T.J. Dillashaw for their dedication and athleticism. Ludwig said that even before a seminar with the group last year, he realized the talent level, but after seeing how open they were to instruction, the possibility of working together intrigued him even more. Ludwig said upon close examination of the camp’s big names, which also notably includes Urijah Faber, there wasn’t a whole lot to fix. There has been, and continues to be, work to tighten up offensive and defensive striking. There are frequent lessons on the sequences of striking, so that specific punches and kicks have more purpose. And there are other things that can’t be mentioned in public, so as not to tip off future opponents on their existence. And make no mistake about it, Ludwig’s hiring was very much a nod to the future, and more specifically, next opportunities to win gold. Alpha Male has had wonderful success, but between Faber, Benavidez and Mendes, the camp is a collective 0-for-8 in it last eight major title bouts. In just the last two years alone, they’re 0-4 in chasing UFC gold. With the belief that MMA at the highest levels is won in the details, Ludwig says his job will be to correct the minor mistakes that have cost the team’s members in the past. Asked if it will be fair to judge him based upon whether or not Alpha Male does win gold, Ludwig didn’t flinch. As a fighter, Ludwig never reached the championship level himself, at least in a major promotion, although he did knock out Jens Pulver for the UCC title in 2003, at a time when Pulver was considered among the best lightweights in the world alongside Takanori Gomi and B.J. Penn. Though Ludwig has not officially retired — that’s a decision he says he may make around September, when an injured knee reaches full health — he doesn’t exactly miss fighting. It was, he says, a rough way to try to make a living. Despite 35 pro fights, he never made big money. In fact, he says, the check from his bout, a TKO loss to Che Mills in Sept. 2012, was only enough to live off of for three months before things started getting scary. It was exactly around that time that the Alpha Male offer came through. Although he says the fighter within him will always remain, coaching is something he’s always loved, and he’s been tutoring fighters since he was 19 years old. That, along with the talent he’s mentoring, will make his transition to coaching so easy. 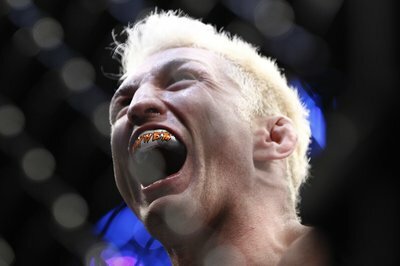 He believes that his top three guys — Faber, Benavidez and Mendes — will all be wearing titles upon receiving another title bout, because by then, they will have incorporated a few small tweaks into their games at his behest.